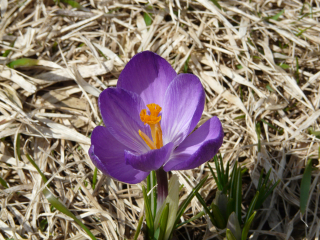 I planted crocuses in the grass the year we moved in. It is such a little surprise to find them. Last fall, I planted tons of bulbs around the house. They are all peaking out, breaking the soil, just waiting to bloom. I haven't had a sunny day since to photograph their progress. The bunnies are loving the crocuses, too. You'll notice the gnawed down leaves at right. Please bunnies, stay away from the tulips because I don't remember what I planted and I'm excited to see what blooms.